This Mel Parry signature series "THE BRUTE" is the newest version of the knife. The main upgrade is the strips of leather between the handle and the grips that provide better shock absorbtion while hacking. Other upgrades include texture cuts where the blade meets the handle, and a triangle hole in the blade for a better grip while pulling nails and or prying. Another feature that has changed that I consider a upgrade is that the Allen screws that hold the micarta grips to the handle have been replaced with flat head screws. Scorpion knives are always boxed well in their custom boxes. The Brute comes complete with a black heavy duty Cordura sheath and a high quality Lanskey sharpener that fits neatly into a pocket in the sheath. 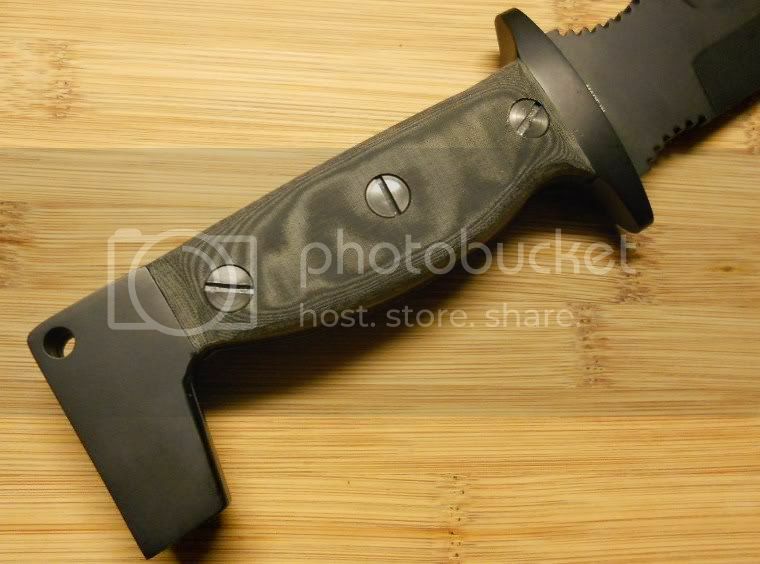 The Brute is a pure combat survival blade designed and developed with efficiency and practicality in mind. A thoroughbred amongst knives, it was borne out of a clear understanding that a knife should be first and foremost a tool. 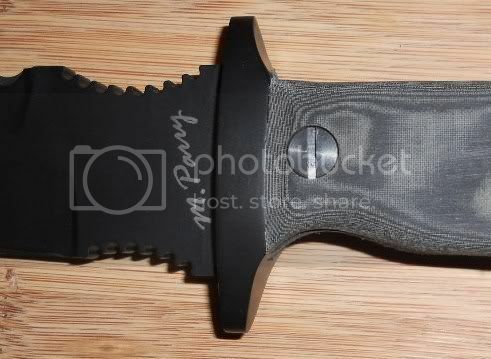 The knife is strong and heavy, made from ¼” (6.4mm) thick high tensile carbon spring steel hardened to 57-58 Rc and coated in black DuPont Teflon. The main edge is bevel-ground for strength. The deep belly shape takes the weight forward giving the knife a powerful chopping stroke. The point is ground as a spear point and is strong enough for digging and prying. Near the choil is a hollow-ground section that can be honed for razor sharpness for fine cutting and whittling, aided by the forward choke. On the top of the blade is a serrated edge for sawing through rope or webbing. This knife is a beautiful piece from Scorpion Knives. More to Come!